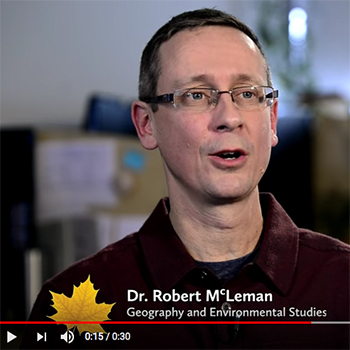 RinkWatch, a citizen-science research initiative led by Laurier faculty members Robert McLeman and Colin Robertson, has joined with the National Hockey League as part of NHL Green’s commitment to ensure all levels of hockey, including hockey played on outdoor rinks, are available for future generations. Since its launch in 2010, NHL Green has been committed to promoting sustainable business practices across the league as well as preserving the environment, including the frozen ponds that inspired and cultivated hockey more than 100 years ago. “The NHL is making genuine efforts to become a leader in corporate environmental responsibility, which fits well with Laurier’s commitment to leadership in environmental research,” McLeman said. Launched at Laurier in January 2013, RinkWatch offers people who love outdoor skating the chance to help environmental scientists monitor winter weather conditions and study the long-term impacts of climate change. RinkWatch users do so by submitting information about skating conditions on outdoor rinks in their neighbourhoods to the RinkWatch website. Video: Laurier's Robert McLeman discusses RinkWatch. "The NHL is making genuine efforts to become a leader in corporate environmental responsibility, which fits well with Laurier’s commitment to leadership in environmental research." Using data submitted by RinkWatch participants, researchers have been able to show that the number of days cold enough for outdoor skating in a typical Canadian winter could decrease by 34 per cent in Montreal and Toronto and by 20 per cent in Calgary during the course of this century as a result of climate change. RinkWatch has also generated valuable information about what motivates people to build outdoor rinks and the important social benefits they bring to communities. The partnership with the NHL will help RinkWatch reach a wide audience.